Local tables in the namespace in which you are using DeepSee. Views in the same namespace. Linked tables in the same namespace. You define a linked table with the Link Table Wizard. The table has a class definition in your namespace but is linked to a table in an external database. There are restrictions on queries when using linked tables. See Restrictions on SQL Gateway Queries in the chapter Using the Caché SQL Gateway in Using Caché SQL. It must specify a query. You can specify the query in an XData block, as described in the first subsection. Another possibility is to implement a callback to construct the query at runtime. This is described later in this chapter. It must define an output specification, which maps the query columns to properties, as described in the second subsection. When you compile a data connector, the system generates a class with the name packagename.classname.ResultSet, where packagename.classname is the full name of the data connector class itself. Do not edit the generated class. You cannot use this technique if the data connector must support detail listings or updates. In such cases, instead see Defining the Query at Runtime, later in this chapter. The XMLNamespace parameter must equal "http://www.intersystems.com/deepsee/connector/query"
The XData block must contain one <sql> element, which contains the SQL query to execute. The query must return the IDs of the records, in addition to other fields you need. The $$$RESTRICT token is case-sensitive. $$$RESTRICT is not a macro. It is replaced at runtime, not at compile time. If you use Caché arrow syntax to access a field, it might be necessary to also supply an alias for the field. Specifically, an alias is required if you use the data connector as the basis of a cube and you want to use the field in the definition of a cube element. In this case, there is no way for a cube definition to refer to the Product->Name field; the build process throws an error if you use either Product->Name or Product.Name. As a consequence, you cannot use this field as the basis of a level or measure. In this case, you can treat ProductName as a property in the source class, so you can define a level or measure based on it. Each <property> element is a property of the data connector and can be used by DeepSee. The XMLNamespace parameter must equal "http://www.intersystems.com/deepsee/connector/output"
This XData block must contain one <connector> element. The <connector> element must include one or more <property> elements. name Name of the property, for use as a source property in a cube, in a source expression in a cube, or as a field in a listing. sourceProperty Name of the corresponding column of the result set. type (Optional) Data type for the property. The default is %Library.String. transform (Optional) An expression that uses %val (the current column value) as input and returns a transformed value. If you are going to use this data connector for a listing, also specify the idkey attribute for the appropriate <property> element or elements. This attribute indicates that the given property or properties represent the IdKey of the data set. If you mark multiple fields with idKey="true", the data connector combines these fields. If you have a cube based on a data connector and listings in that cube that are also based on data connectors, all of these data connectors must have the same property (or properties) marked as idkey="true", because the underlying mechanism uses the same ID values in all cases. To test a data connector, you can directly view the query results by using the test page or by printing output in the Terminal. Open the data connector class in Studio. Click View > View Web Page. By default, this method prints the first 100 records of the output. Where pParameters is currently not used, and pMaxRows is the maximum number of rows to display. Instead of defining a hardcoded query in an XData block, you can construct the query at runtime. If the data connector must support detail listings or updates, you must use this technique. Where pParameters is currently unused, and pResultSet is the result set. "all"  Indicates that the cube is being built or that an All member is being shown. "idlist"  Indicates that a listing is being requested. "single"  Indicates that %ProcessFact() has been invoked. Creates an instance of %SQL.Statement. The query must return the IDs of the records, in addition to other fields you need. You define a basic query for use with the "all" mode. You add a restriction when the mode is "single", to get the single record that is being updated. The first subsection provides details. You add a different restriction when the mode is "idlist", to get a subset of the records. The second subsection provides details. Execute that statement, optionally passing to it any runtime values as parameters. Certain runtime values are available as properties of the statement instance, as discussed in the following subsections. This step creates an instance of %SQL.StatementResult. Return the instance of %SQL.StatementResult as an output parameter. set sql = sql _ " where %ID = ?" When a user requests a listing, DeepSee retrieves the IDs of the records used in the given context and stores them for later use. For a default listing, DeepSee automatically uses those IDs in the SQL query of the listing. When you create a data connector for use in a listing, you must add logic so that your query uses the IDs. _DSqueryKey  Identifies a listing. _DSsourceId  An ID, as in the original source data. Here, the first five rows are associated with the listing 83616140, which uses the IDs of five records, given in the _DSsourceId column. The next two rows are associated with the listing 2139316107, which uses the IDs of two records. listingtable is the name of the listing table for the cube. 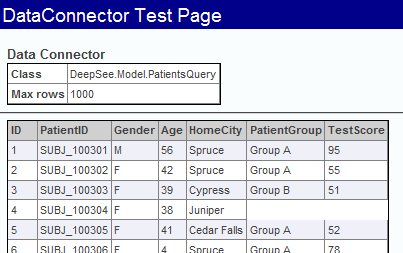 To get this table name, you use the %listingTable property of your data connector. somekey is the unique key for the current listing. To get this key, you use the %listingKey property of your data connector. This approach can lead to <MAXSTRING> errors and other size-related issues. Perform a JOIN between the source table and the listing table with the correct WHERE clause. The following shows an example, from a data connector that is used as the source for a cube and as the source for a listing. Notice that the listing key is passed to the query as a parameter. set sql = "SELECT %ID, fdate, fname, ftimestamp FROM TestTD.TimeDimensions"
set sql = sql _ " where %ID in (select _DSsourceId from "
_ ..%listingTable _ " where _DSqueryKey = ?)" The %DeepSee.DataConnector class provides additional callback methods that you can customize to handle errors, perform transformations on rows, perform filtering, and so on. These include %OnNextRecord() and %OnProcessRecord(). For details, see the InterSystems Class Reference. Create an instance of it. Invoke its %Execute() method, which returns a result set. This method also returns a status by reference. If the status is not an error, you can now use the result set, which is an instance of %SQL.StatementResult.